1,124 pages | 201 Color Illus. | 47 B/W Illus. For three decades, this book has been acknowledged as the most respected scientific reference specifically devoted to marine mammal medicine and health. 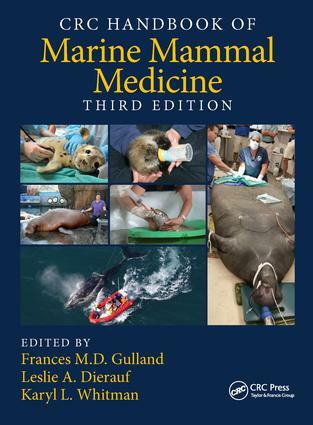 Written by approximately 100 contributors who are recognized globally as leaders in their respective fields, the CRC Handbook of Marine Mammal Medicine, Third Edition continues to serve as the essential guide for all practitioners involved with marine mammals including veterinarians, technicians, biological researchers, students, managers, keepers, curators, and trainers. The 45 chapters provide essential information for the practitioner on pathology, infectious diseases, medical treatment, anesthesia, surgery, husbandry, health assessment, species-specific medicine, medically pertinent anatomy and physiology, and global health concerns such as strandings, oil spills, and entanglements of marine mammals. The book guides the reader through the veterinary care of cetaceans, pinnipeds, manatees, sea otters, and polar bears. In addition to summaries of current knowledge, chapters provide information on those digital resources and websites which present the latest information as it emerges in the field. The CRC Handbook of Marine Mammal Medicine, Third Edition gives a call to action for scientists to experiment with new endeavors to engage and inspire current and future generations to care for marine mammals and the marine environment, and work together to find solutions. As the most trusted reference for marine mammal conservation medicine and for marine mammal medical facilities around the world, this book needs to be in your library. Preface. Climate change, regional issues. Global Marine Mammal Health Concerns. Stranding networks and response. Oil spill response and effects. Whale entanglement response and diagnosis. Zoonoses and public health. Ethics and animal welfare. Anatomy and Physiology. Overview of dive responses. Anatomy. Endocrinology. Stress. Reproduction. Immuno-diagnostics. Genetics. Pathology. Gross necropsy and specimen collection. Non infectious diseases. (update plus noise, gas bubble disease, freshwater disease). General toxicology. Biotoxicoses. Infectious Diseases. Viruses. Bacteria. Mycoses. Protozoa. Helminths and Arthropods. Medicine, Anesthesia and Surgery. Dentistry. Ophthalmology. Diagnostic Imaging. Endoscopy. Anesthesia. Pharmaceuticals and Formularies. Euthanasia. Husbandry. Nutrition and energetics. Hand rearing and artificial milk formulas. Environmental considerations. Tagging and tracking. Transport. Health Assessment (How to examine, collect blood, urine, csf, feces, breath, photogrammetry, biopsy). Whales. Dolphins. Pinniped. Walruses. Sirenians. Polar bears. Species Specific Medicine (with blood values, clin path changes with relevant diseases). Cetaceans. Seals and sea lions. Walruses. Sirenia. Otters. Polar bears. Appendices. Conversions. Abbreviations. Leslie Dierauf, V.M.D. is a retired wildlife veterinarian, having pursued a successful and unique professional career in a variety of venues. Most recently, from 2008-2011, Leslie served in a federal agency capacity, as the senior executive Pacific Northwest Regional Director, and prior to that as the Director of the National Wildlife Health Center for the US Department of the Interior’s US Geological Survey (USGS). Between 1994 and 2004, Leslie worked for the US Fish and Wildlife Service in the Southwestern US, primarily with local communities in NM, AZ, TX and OK, working together to create land, water and development plans while protecting a multitude of threatened and endangered species through habitat conservation plans and the Mexican gray wolf reintroduction program. In 1990, Leslie was honored with a Congressional Science Fellowship from the American Association for the Advancement of Science; following that year in Washington, DC, she continued to work for three years as a Science Advisor to the US House of Representatives, primarily on marine and aquatic policy, as well as fish and wildlife conservation. She was instrumental in drafting and then helping pass Title IV of the Marine Mammal Protection Act, placing responsibility on the National Marine Fisheries Service and the US Fish and Wildlife Service for unusual mortality events (UMEs) in marine mammals. Currently Leslie lives in West Seattle, WA (overlooking the Salish Sea), with her husband Jim, and serves on the Boards of SeaLife Response, Rehabilitation and Research (SR3) and the SeaDoc Society, both marine ecosystem health public/private nonprofits. Frances M. D. Gulland, Vet MB, PhD, MRCVS is a veterinarian at The Marine Mammal Center in Sausalito, California. She has been actively involved in the veterinary care and rehabilitation of stranded marine mammals and research into marine mammal diseases there since 1994. Her interests include determining the impacts of human activities on marine mammal health, and how marine mammals can in turn serve as indicators of ocean health. She received a veterinary degree from the University of Cambridge, U.K., in 1984, and a PhD in Zoology there in 1991. She currently serves as Commissioner on the U. S. Marine Mammal Commission. Karyl L. Whitman, Ph.D is a wildlife behavioral ecologist interested in applied ecology and mitigating human effects on wildlife. She received a B.A. in Archaeology and Anthropology from Rutgers University. As a John D. and Catherine T. MacArthur Fellow, Karyl received her Ph.D. in Ecology, Evolution, and Behavior from the University of Minnesota in 2006 under the direction of Dr. Craig Packer. Her research modelled the effects of trophy hunting and developed a new method to non-invasively age African lions that has been instrumental in reforming the hunting industry across several African states. She has studied a variety of East Africa wildlife, however more recently she assists with field research of California sea lions and northern fur seals in California. Karyl serves as a scientific advisor on the African Lion Working Group and to the Serengeti Lion Project. She currently lives in Seattle with her four children and husband, Tom Gelatt, who is the real marine mammal biologist in the family.